In 1981, an increasing number of gays and intravenous drug users had a marked deficiency of white blood cells, an essential component for the immune system—a condition later called acquired immunodeficiency syndrome or AIDS. As cases rapidly spread globally, laboratories sought to determine its cause. Some fiercely competitive scientists eagerly sought priority for this discovery, and nowhere was this competition more intense than between Robert Gallo and Luc Montagnier. Priority for discovering the viral cause of AIDS was not only the subject of an acrimonious dispute between scientists but also international contention between the governments of the United States and France that required their respective presidents—Ronald Reagan and François Mitterrand—to resolve. At issue was which government would be awarded a patent for testing and detecting the virus. It was decided, in a Solomonic tradition, that each individual would be given equal billing for the discovery, patent royalties would be divided equally, and that the virus be given a neutral name: human immunodeficiency virus or HIV. In 2008, the Nobel Prize was jointly awarded to Montagnier and his colleague Françoise Barré-Sinoussi, but not Gallo, a decision that “surprised” Montagnier. It is now generally (but not universally) agreed that although Montagnier’s laboratory was first to isolate HIV, Gallo was first to attribute the cause of AIDS to HIV and generated the background science, making the discovery of HIV possible. There were an estimated 34 million living individuals with AIDS in 2013. SEE ALSO: Adaptive Immunity (1897), Viruses (1898), DNA as Carrier of Genetic Information (1944), Viral Mutations and Pandemics (2009). 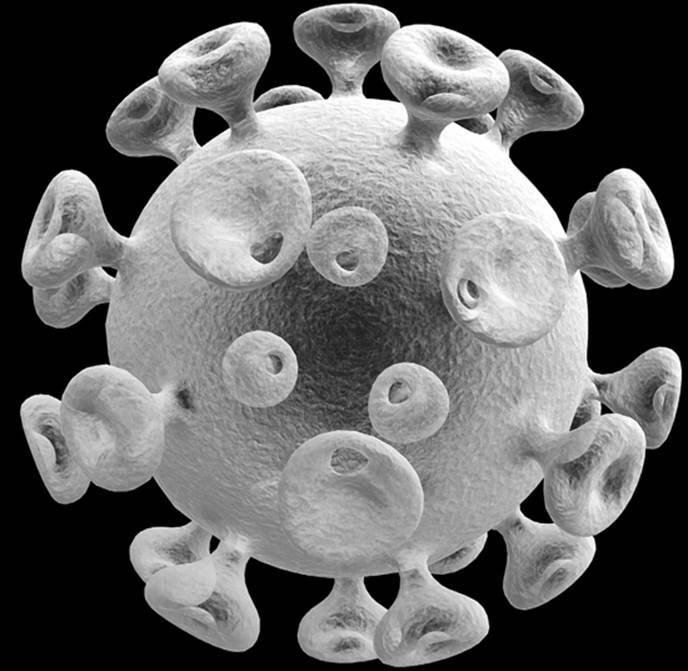 The discovery that human immunodeficiency virus (HIV, shown) is the cause of AIDS led to the transformation of AIDS from a death sentence into a chronic, treatable disease.